Babies can suffer an earache for many reasons, including sinus pressure from a cold, teething and an ear infection. Signs of an earache may include pulling on the ears, shaking the head, crying, irritability and trouble sleeping. In many cases, parents can soothe their baby's earache with home remedies. However, if an earache persists after you have tried to soothe it, call your pediatrician for advice. An earache can be extremely painful and can be a symptom of something, such as an infection, that requires medical attention. Lay your baby down on the ear that is not affected. In some cases, simply relieving pressure on the affected ear can ease pain. The American Academy of Pediatrics recommends that babies be put to sleep on their back through the first year of life to prevent suffocation. However, you can safely lay your baby on his side while you are watching. Do not leave him unattended on his side. Give baby a teether. Teething pain can lead to ear pain, so offering something to soothe the gums may also soothe the ears. 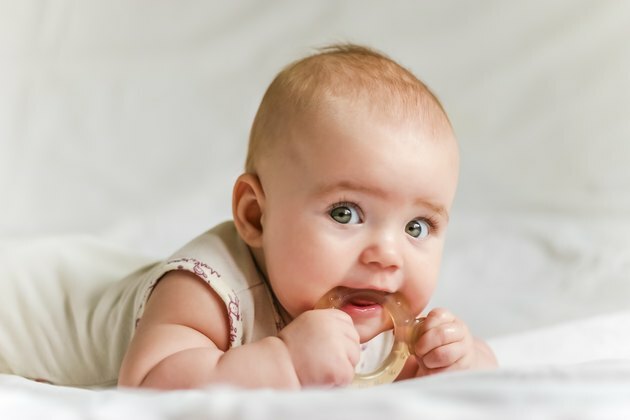 Cold teething toys, a cold washcloth or even frozen fruit inside a mesh teether can provide relief. Use a saline solution to clear the nose if baby has a cold or is congested. Sinus pressure can lead to ear pain. Put a few drops of an over-the-counter saline solution in baby's nose, and then use a nasal aspirator to gently suction some of the mucous. Wiggle the ears lightly. Gently grasp the ear lobes and tug them lightly. The wiggling motion may relieve some of the pressure in the ears. Apply a warm compress. This may relieve some pressure. Be sure that the compress is not too warm to the touch. Apply a few drops of warm oil to baby's ear. Dr. William Sears says that the oil will not harm the ear and it can soothe an inflamed eardrum. A vegetable oil like olive oil should be used and warmed slightly. Consult with your pediatrician about the need for pain relievers, anti-inflammatory drops or antibiotics. Infections and inflammation may need to be treated with more than home remedies, but only your doctor can provide this advice. Contact your doctor as soon as possible when you notice ear pain. Your doctor can ask you about symptoms and advise you on whether an office visit is necessary.